Well, Marvel is definitely committed to making Captain America their greatest villain as he's now ordered the murder of Agent Phil Coulson, arguably the one Marvel Cinematic Universe character fans most deeply loved. The former hero's new Secret Empire may be starting its own war on Marvel's "fake news" media, and ordering that all American Inhumans be imprisoned as terrorist threats, but the latest issue of Deadpool actually travels back to the day his betrayals leading up to Steve Rogers's betrayal - and the man who almost stopped it. Previews of the issue showed how close Phil Coulson came to stopping Captain America, before he was sidelined by the title mercenary. The issue itself delivers the heartbreaking fate of the Agents of S.H.I.E.L.D. star, without much room for a return. Now it looks like the newly-returned Captain America doppelganger is the Marvel Universe's only hope... but even if they save the day, Agent Phil Coulson won't have lived to see it. Get the details on the new twist below. Fans of Marvel and Secret Empire got their first glimpse of the issue in question weeks ago, when preview pages for Deadpool #31 showed just how much earlier than assumed Steve Rogers's plan had been uncovered. It began with - who else - Agent Phil Coulson, played by Clark Gregg in Marvel's Cinematic Universe. After making his splash in the Marvel films, Agent Phil Coulson (in Gregg's image) has risen in prominence in the inner workings of the comic book S.H.I.E.L.D., keeping his idolization of Steve Rogers intact. Which is why he was so crushed to discover his hero's treachery. The issue shows how Coulson's early admiration for Cap gave him the insight needed to spot what other's didn't: that the 'miracle' which saw Steve Rogers rejuvenated and de-aged prior to his Captain America: Steve Rogers launch had... changed him (fans wouldn't notice until Issue #1 saw Steve "Hail Hydra"). By cloning Cap's phone and uncovering that he was behind the Chitauri attacks on Earth, Coulson attempted to inform his fellow agents. But by then, Steve's surprise attack had been launched, shutting down communication agency-wide. In the midst of sending out the message so that someone may still prevent Steve's betrayal, Coulson is shot out of the sky. And so Lola, the beloved flying car, is reduced to a burning heap... and Coulson is left scrambling with an un-killable assassin hot on his heels. Coulson's On The Run From... Deadpool? The man responsible for blowing Coulson out of the sky is none other than Marvel's infamous Merc With a Mouth, Deadpool (obviously). The issue shows that Wade Wilson came from a similar childhood to Phil Coulson, at least in the sense that both men began as boys who loved Captain America. When Wade grew up to be a killer all his own, he was over the moon when recruited by Cap to serve as a member of his Avengers - which means he's among the least likely to believe that Captain America has become the villain. It's something Coulson recognizes immediately, fleeing Deadpool and wondering what lie Steve Rogers has given the mercenary to make him track down Coulson as the actual threat to S.H.I.E.L.D.. After getting a lead on Deadpool Coulson heads for a nearby safehouse, intending to make sense of the larger conspiracy - and figure out how to save Cap from whatever he's tangled up in (oh, if only Coulson knew how evil Captain America would become). But Deadpool catches up, meaning Coulson has no choice but to try to reason with him. Deadpool raises a fair point, especially given Cap's role in the first Civil War: if you're choosing sides for an uncertain future, the one Steve Rogers chooses is usually the right one. The bad news is... Deadpool wasn't fed a lie by Steve Rogers at all. He was given an order. That's right, only when Deadpool has Coulson cornered in his closing safe room is the full story revealed. 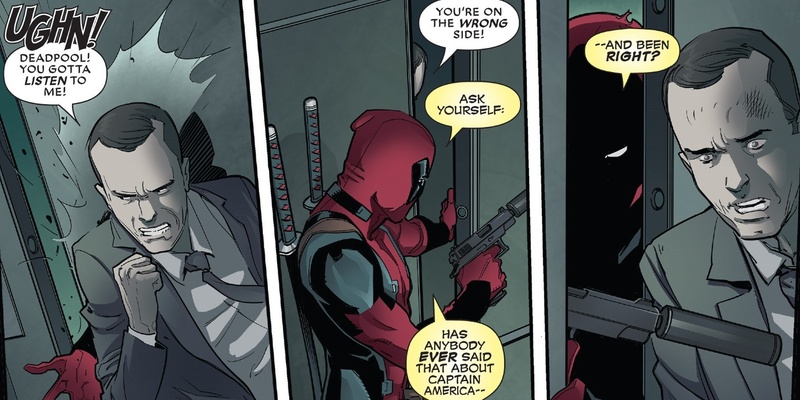 Deadpool was contacted by Captain America to not only find Phil Coulson, but eliminate him on sight. It's cloaked in the secrecy of covert operations, and motivated by Wade's belief that, deep down, Steve Rogers is still a good person... and not a Nazi-aiding Hydra mastermind. And as Phil Coulson crumples to the floor in a growing puddle of blood, the reader is left to consider his final thought: that whatever Captain America is about to unleash... he could have stopped it all. Unfortunately, Steve clearly knew who to call. And as Deadpool exits the safehouse to meet the man who ordered the hit, it is consumed in a fiery explosion, leaving no doubt: Agent Phil Coulson has been murdered on Steve Rogers's orders. Steve calms Wade's nerves by explaining that covering up the scene won't matter soon enough, as the country is about to undergo some "seismic changes." And having killed a good man because Cap commanded it, Deadpool has proven himself willing to help Hydra's America become a reality. If it wasn't clear already, Marvel really is committed to seeing this Secret Empire through, no matter how many lives are lost in the process. NEXT: Can Ultimate Captain America End Secret Empire? Deadpool #31 is available now.